600 years before Christ people lived in Winsum, which forms together with Obergum a twin village. Still today it is to be seen at the houses and mansions that Winsum was in former times a rich place. Worth seeing the two charakteristique mills, the child book museum the old Dorfcafi "De Gouden Karper"... further there is in Winsum a bicycle -, a canoe rental company, and a heated open-air swimming pool "De Hoge four". Winsum - Groningen boat rental netherland channel boat. 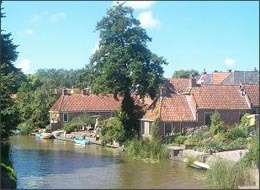 Cannel boat holiday netherland, Boat rental Leeuwarden Friesland. Yachting Friesland boating Charter holiday. Inside waterways with narrowboat boating holiday.North Friesland cruising boating holiday. North Friesland by motor boat. Charter Leeuwarden, boating holiday. Route Friesland by motor boat cruising. Boat cruise,visit Friesland by boat cruising, Friesland by boat. Boat 'n bike, cruising Friesland, waterways and lakes in Friesland. Looking for Hire company Yachtcharter Leeuwarden. Cannel barges hire, narrowboat, cruise on dutch inland waterways, Boating holiday by Yachtcharter Leeuwarden.